Sinn Fein has taken up its position on the North’s Policing Board for the first time this morning. Talks between Taoiseach Bertie Ahern and potential coalition government partners have been hit by fresh controversy over suspect payments received by him when he was Minister for Finance. Sinn Féin’s hopes for a major breakthrough in the 26 Counties with this election were not borne out, despite some impressive performances and an increase of some 20,000 votes over their 1997 total. A Sinn Féin motion calling for new equality legislation was defeated due to unionist opposition in the assembly last week. British officials have proposed deploying special ‘anti-terrorist’ legislation across England, Scotland and Wales in an attempt to retain the repressive measures in Ireland. PSNI police have raided the home of a Strabane republican in an escalation of tensions between local republicans and the force. There have been clashes at the construction site in the Tara valley where the Dublin government is attempting to construct a motorway through an important archaeological site. Taoiseach Bertie Ahern is considering a number of coalition options as the 26-COunty general election counts are completing. Deputy Prime Minister and Progressive Democrats leader, Tanaiste Michael McDowell, has quit Irish politics in a dramatic response to his election defeat today. The 26-County general election now seems almost certain to return Fianna Fail’s Bertie Ahern as Taoiseach, who may do so without the need to again form a coalition with the decimated Progressive Democrats. In unofficial tallies in Thursday's 26 County General Election, the vote for Bertie Ahern's Fianna Fail appears to be up and, while it is early days in the election count, the party looks likely to form part of the next government in Dublin. Roisin McAliskey has been arrested on foot of a new extradition bid by Germany. Bertie Ahern could be returned as 26-County Taoiseach for a further five years, according to the latest polls, but only if he finds a new coalition partner. Derry Republican Charlie McMenamin has walked free from court 27 years after he was wrongly convicted. The DUP’s Gregory Campbell has said his party will veto an Irish Language Act for the North of Ireland. Sinn Féin has criticised the PSNI after a prominent republican was arrested during a raid on addresses in County Armagh and in Dungannon, County Tyrone. Sinn Féin is prepared to co-operate with any independent, international inquiry into the 1998 Omagh bomb, it has been confirmed. The restoration of power-sharing in Belfast marks the dawning of a new era for the island of Ireland and for Anglo-Irish relations, Taoiseach Bertie Ahern told British parliamentarians last week. The election campaign in the 26 Counties is heating up with just over a week left to polling day. The appointment of two senior members of the DUP to the Privy Council, allowing the party to gain access to high-level security intelligence, has been criticised by nationalists. The planting of a walnut tree on the Battle of the Boyne site in County Meath by 26-County Taoiseach Bertie Ahern and DUP leader Ian Paisley on Friday has highlighted a new dispensation in north-south relations. Sinn Féin has confirmed that it will take up its seats on the North’s Policing Board, which has a supervisory role with the PSNI police. Republican prisoners held in Maghaberry jail have agreed to suspend their 10-month long protest. British army helicopters being flown in rural County Tyrone at night-time, apparently as part of preparations for “foreign” war zones, are infuriating residents. British Prime Minister Tony Blair has announced his decision to stand down as leader of the British Labour Party and resign as Prime Minister on June 27th. 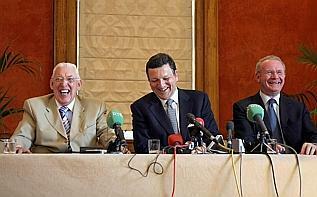 The Six Counties have a new power-sharing Executive in another historic day at Stormont. The Progressive Democrats said they were within hours of quitting the 26 County coalition government with Fianna Fail yesterday as a crisis over corruption allegations continued to dominate the general election campaign. The North’s deputy first minister-designate Martin McGuinness has predicted Sinn Féin will be “the story of the election” in the 26 Counties later this month. An announcement by the unionist paramilitary UVF that it is effectively ‘standing down’ has been welcomed, but there were calls for it to go much further. Campaigners have won a four-year battle to force the Dublin government to officially recognise an annual event to commemorate the Great Hunger. Scotland moved closer to independence after the Scottish National Party (SNP) became the largest party in the Scottish parliament this week. 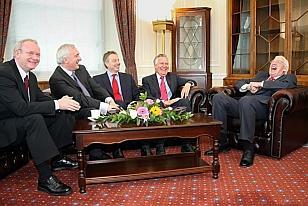 British Direct Ruler Peter Hain has signed the order paving the way for a new era of power-sharing to begin. The unionist paramilitary UVF has said it “will assume a non-military, civilianised, role” from midnight and claimed that its arms have been “put beyond reach”. Intense election campaigning has begun in the 26 Counties after the Taoiseach Bertie Ahern’s early morning visit to the Presidential residence, Aras an Uachtarain, to finally dissolve the Dublin parliament on Sunday. 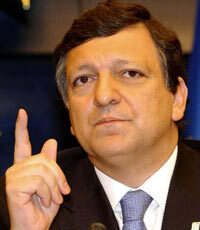 The President of the European Commission Jose Barroso visited Belfast on Tuesday to announce financial aid and support for the new Six-County administration. A row how has broken out over plans by the 26 County leader Bertie Ahern to make a high-profile address to the London parliament at the height of the 26 Countyh election campaign. Just 24 hours after the 26 County Minister for Transport ‘turned the sod’ on the billion-Euro M3 motorway project in Co Meath it has been confirmed that a site of major archaeological importance has been discovered. A man has been arrested after shots were fired at the funeral of former Official IRA leader Johnny White. Campaigning is today drawing to a close in the British local elections which could see Scottish nationalists become the largest group in the devolved Scottish parliament at Holyrood.